These days the web and mobile app development have reached another level. Almost all the companies are in need of a developer at one point or another and this is the situation where the entire company falls in a dilemma. The CEOs and CTOs are often confused about who to hire for the betterment of their company. is a freelancer better or should I go with a remote developer? This is a very common question that pops up in any CEO mind of an organization. It is very important to have a clear idea about the benefits of either of them before picking one option. 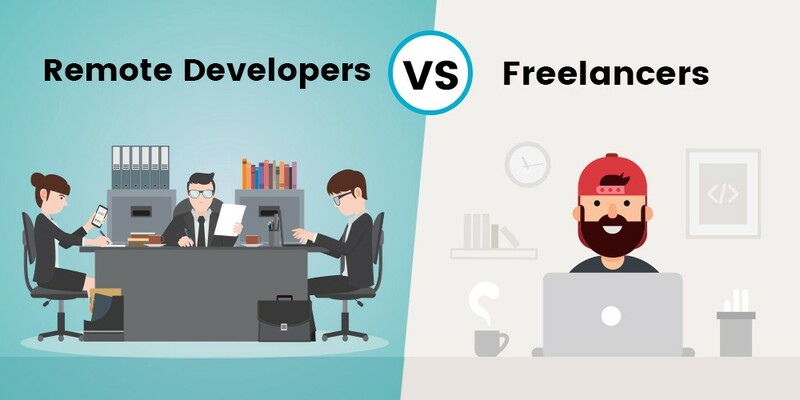 In this blog post, we will be discussing “Why businesses prefer in-house development?” relatively than the freelancers. Many businesses out there look out for the in-house developers to work for their company rather than the freelancers. The pros of in-house developers will suggest that it is better for us to opt the remote or in-house developers rather than going for a freelancer. From cost to the management of work, every topic will be discussed in this article and you will be provided with a clear idea about the advantages of in-house developers or remote developers. You can hire a remote developer from any software company with some terms and conditions in place. Any software development company who is engaged in website development full time will provide you with an assigned developer in order to complete the task with both speed and quality. The company can also get the Non-Disclosure Agreement (NDA) signed by the employees. This will give both developers and the company an understanding of the project. Hiring dedicated developers from a company for a particular project will also help you in the product support apart from its development. The company itself puts in a lot of efforts and uses the enterprise-grade level software and tools to consolidate the task and deliver a high-end product. There are so many advantages of hiring a remote developer for any company. Here are some of the important advantages of hiring remote developers. No matter whatever business you are in, the expertise matters most. It is important for people to consider expertise before hiring any person. The developers who are assigned by companies will surely have a great experience and they would have already dealt with some of the projects that are similar to yours. From working under stress to developing a top-notch product, the experience of the developers will come in handy in all the situations. If you hire an employee of a particular company for web or mobile app development, the company ensures that the employee is provided with the dedicated resources to complete your project. The satisfaction of the client is the utmost priority for the companies and they will ensure that their developers are provided with the perfect resources and other requirements so that you can get the product that you have desired. The companies will provide a team of developers if you need. You can assign them with bulk projects at once without worrying about the timeline and in-time deliveries. Business is all about security. You cannot just hire any developer to complete the project because sharing the details with someone you don’t know can lead to some disastrous situations. They may use the details to develop some other software or app, etc. The confidentiality of both you and the project may get compromised. This is the reason why you should hire a developer from a company so that you will be able to rely on them to get the project done without any hassle. The companies agree to a confidentiality agreement and they are bound to follow it under any circumstances. This will provide you with the assurance that your project is in safe hands. You will expect a quality product when you hire a developer for it. The companies will ensure that you are provided with the quality that you have been expecting. They will have a quality assurance and tester team who will check the product as many times as required and make it the perfect product that you have been wanting all along. The dedication and commitment these developers provide while crafting any product is amazing and it is something that you get from the remote or in-house developers only. When you are working on a project you will be expecting the presence of the developer all the time so that you can get them working whenever required. They will be flexible and available to chat with you whenever required. This is one of the most important tactics of a remote developer. Communication is one of the most important requirements of a business. No matter how good developers you have at hand, it all goes in vain if you don’t get a chance to communicate with them. The communication is the key to the success of a business and if the remote developers are bound to stay in touch with you all the time. They will be available all time via calls or emails or through any other communication method so that you can talk with them about any updates or requirements promptly. When you make the cost comparisons of freelancers and employees you will understand that the in-house or remote employees are a better option for you. The freelancers usually charge per hour or per project basis but the scenario with in-house employees is different. They are on a payroll basis and you will be giving them a salary every month. These are some of the reasons why you should hire remote or in-house employees rather than freelancers. 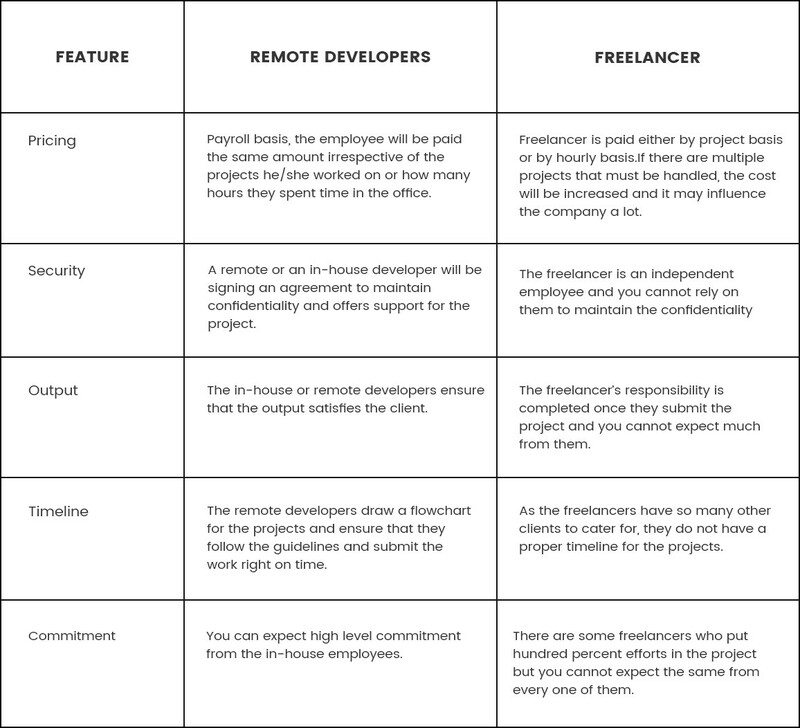 If you are confused about hiring freelancers vs remote developers, this comparison chart will aid you. If you are just starting out your business, it is better to hire a remote employee and pay them the salary on a monthly basis than going for freelancers. You can approach the best software development company for the same. There is a higher tendency of remote employees being staying more dedicated in their work towards the organization and offer services of better quality levels.